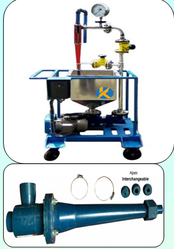 Offering you a complete choice of products which include sieve shakers, hydrocyclone test rig, concentration table, spiral test rig and laboratory pulverizer (hammer mill). Testing is accomplished by stacking a set of sieves of various sizes on top of each other, where the larger-hole sieves are on top and smaller-hole sieves are on bottom, in decreasing order. A solid pan is at the bottom to catch all sample particles that can pass through the smallest sieve's openings. The R sieve shaker is an apparatus that holds the entire stack of testing sieves, mechanically shaking/rotating them in a circular motion and tapping the top of the stack at the same time. These actions help the various sized particles to be able to move through the stack of sieves until they rest on a sieve whose openings are too small for them to pass through. After a designated period of time of this mechanical shaking/tapping, the screens are removed from the Rotap, and each sieves contents are weighed up and recorded individually. From this data set, the % retained on each sieve is used to classify the size fractions present in the sample. The materials of construction of Grinding Media depend up on the type of samples to be grind. For Geological Ores & Minerals - Hardened Steel Grinding Media. For Alloys - Tungsten Carbide Lined Grinding Media. For Coal & Coke - Tungsten Carbide Coated Grinding Media. 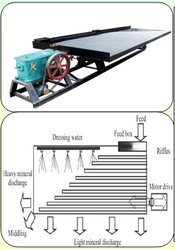 Hydrocyclone Test Rig is invaluable for laboratory or on-site evaluation of potential hydrocyclone applications. Easy to use on a manoeuvrable wheeled chassis, the rig includes pump, sump, pipework, pressure gauge and valves. One and two inch hydrocyclones are available with a range of vortex finders and spigots. For coarser cut points stub cones can be provided for the two inch unit. A displacement pump delivers the slurry under test from the sump to the hydrocyclone. The pump is driven by an electric motor to the Client’s specification. By-pass, valves and pressure gauge enable accurate control of hydrocyclone operating pressure. After connecting to a suitable electricity supply the rig can be used to test either a batch sample of the material under investigation or a small continuous ‘side stream’ from a relevant process plant. The unit is designed to carry out wet gravity separation tests on minerals and other granular materials. A choice of the decks with either "Sand" or "Slime" is available. The head motion is of rugged construction and requires minimum maintenance. The Concentrating Table gives precise separation and is able to make a sharp cut with high recovery. - Adjustable stroke length, deck angle and stroke speed. - Provided with feed box; product launders and variable speed drive systems. - Both wooden and P.U. Decks are available. - Riffles and deck form a common surface. For coarse to fine dry & wet grinding of all types of chemicals, coal, colours, cosmetics, dyes, food colors, fertilizers, gum, gram flours, manures, minerals, medicine herbs, pharmaceuticals, plastics, paints, pigments, pesticides, sugar, spices, salt, tobacco, tea pre-mixes etc. 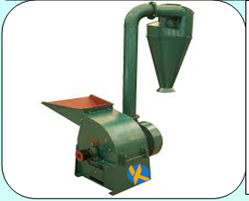 Micro Pulverizer is compact, low cost, highly efficient grinding mill, capable of grinding variety of products from coarse to fine mesh size. Material to be pulverized is crushed between high speed moving beaters & serrated liner & by impact between rapidly moving beaters & the particle itself, the energy of the rapidly moving beaters dissipating itself into the particles being ground by virtue of their inertia, thus causing the particles size reduction.